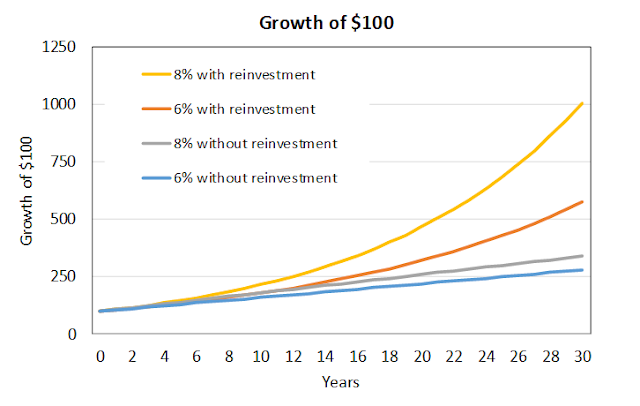 Compounding is the process of generating more return on an asset's reinvested earnings. To work, it requires two things: the reinvestment of earnings and time. 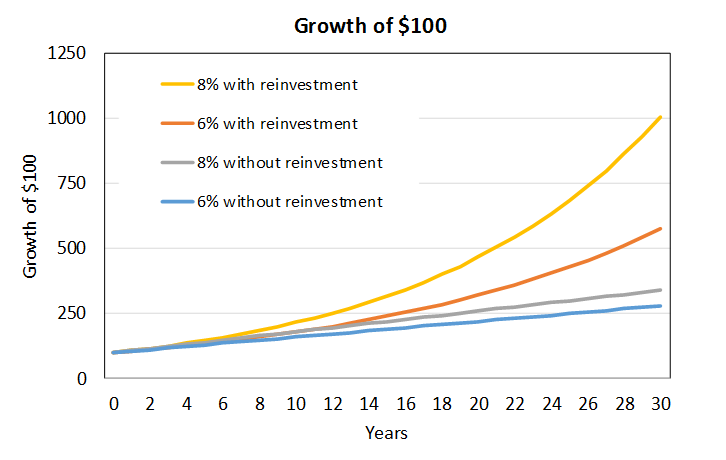 Compound interest can help your initial investment grow exponentially. For younger investors, it is the greatest investing tool possible, and the #1 argument for starting as early as possible. 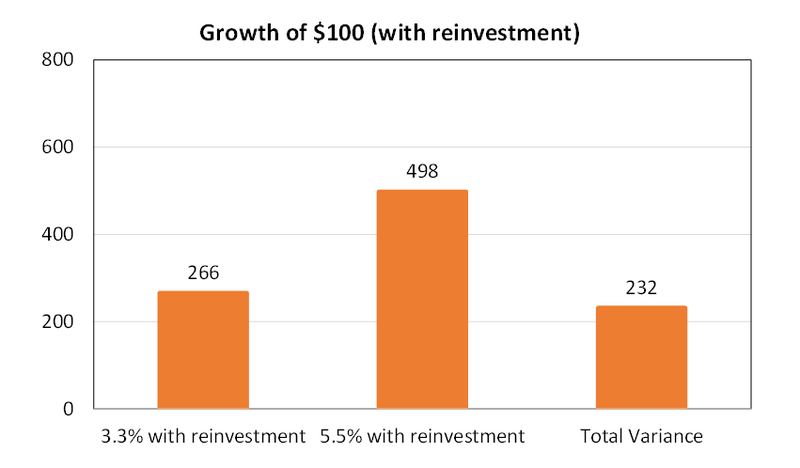 This post will outline the benefit further, as well as show some examples of how large this benefit can be when an investor is focused on maximizing their compounded return. I'll then finish with some thoughts on how investors can more effectively compound their returns through tax aware investing. The most important aspect of this formula is the exponential benefit of time (i.e. compounding shifts gains from a linear path to one that becomes more and more rapid in dollar terms). 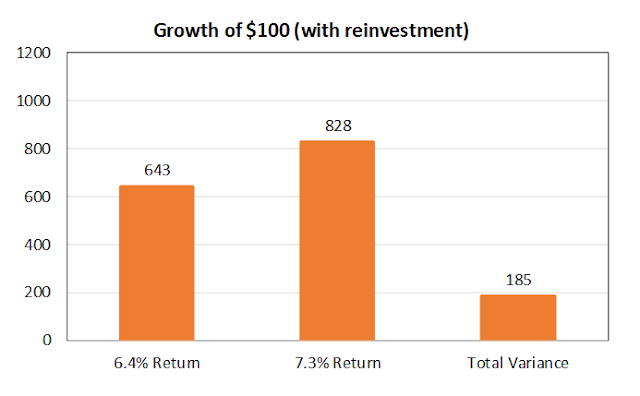 The result is that the level of annual return can matter less to long-term results than the ability to reinvest at that level of return. 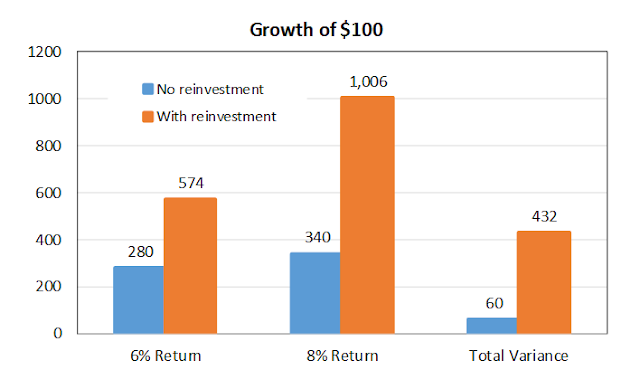 Example: Growth of $100 assuming 6% / 8% returns with no reinvestment and with reinvestment. This isn't to say that the level of return doesn't matter. Not at all. While most investors can grasp that limiting the impact of taxes can increase the level of total returns captured, I am not as sure many investors truly understand how this benefit can increase over time. 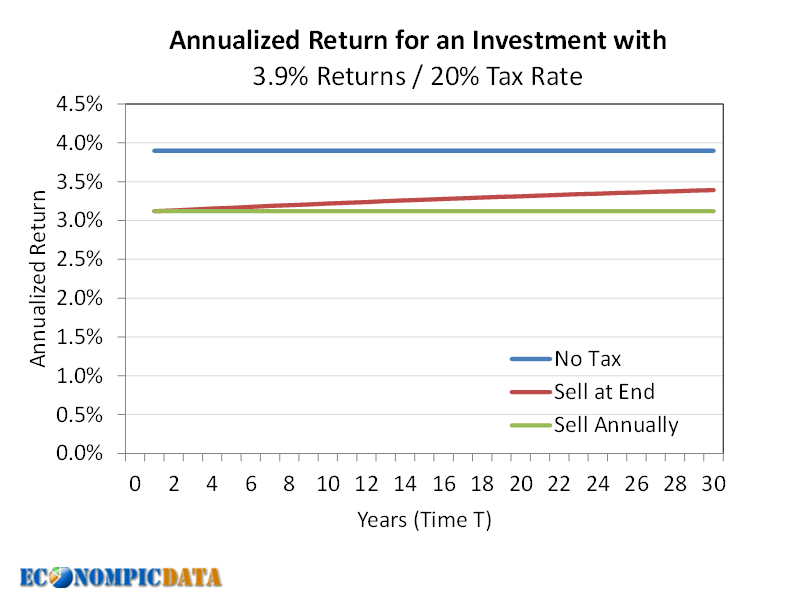 The below chart is my attempt to clearly articulate how tax efficient investing can increase the rate of return that becomes embedded in the compounding machine (I used lots of simplifications in the below including no dividends to deal with and assuming all gains are long-term at the highest 20% tax bracket). The line corresponding to no tax is straight forward enough. If an investment returns 8% annualized, there are no taxes, and you reinvest all proceeds... you receive 8%. If you sell at the end of each year and are taxed at a 20% rate, you receive 8% * (1- 20%) = 6.4%... also straight forward. Where things get interesting are for those that can postpone taxes in the 'sell at the end' line. Here the annualized figure starts in a similar situation as sell annually (i.e. if your holding period is 1 year it is identical), but for each year you postpone the payment of taxes, the more returns can compound before paying them out. 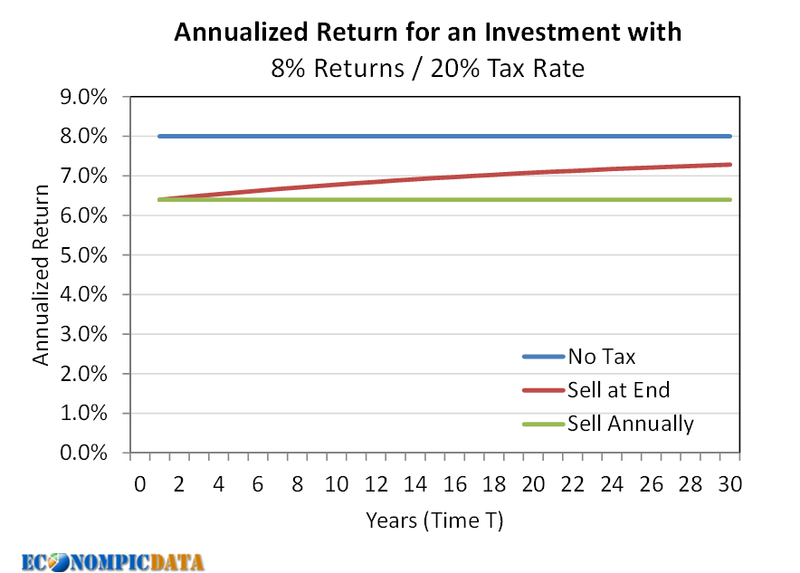 Thus, the annualized return captured by an investor shifts higher, getting closer to the return for an investor with no taxes at all than those taxed annually (in this example, the sell at end annualized return is 7.3% in year 30, closer to the 8% return of no taxes than the 6.4% return if taxed annually). In each case, the investor is avoiding short-term capital gains (i.e. keeping their tax rate at the minimum level), but the result is still material. Stocks happen to be a very tax efficient asset class if done right. An owner of a stock for more than a year pays "only" 20% at the highest current tax rate. Things are much less reasonable in other areas of the market... notably with taxable bonds where all income is taxed at the investor's income tax rate. 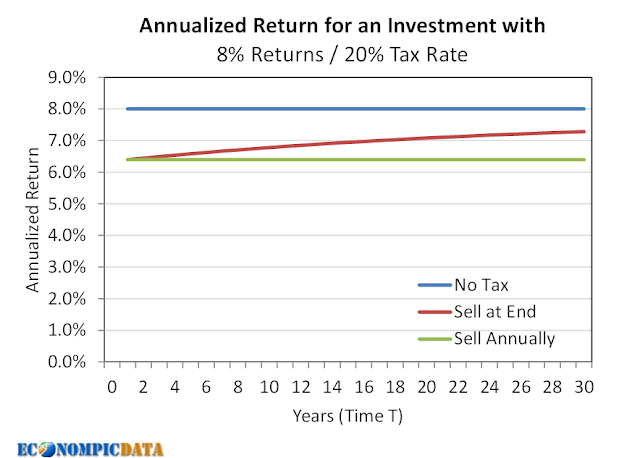 The chart below is an example of the impact for an investor assuming high yield bonds return the current yield to worst (5.5%) for the foreseeable future and that the returns are taxed at the top 39.6% tax bracket (5.5% return becomes a 3.3% return after taxes - and the taxes cannot be postponed for bonds in a taxable account). In this example, the impact of taxes on bonds is greater on a dollar per dollar basis than it is for stocks despite lower returns... in the stock example above, stocks returned 8% while in this example bonds returned 5.5%, but the variance moved from a $185 difference to a $232 difference. The interesting comparison thus becomes stocks vs bonds. 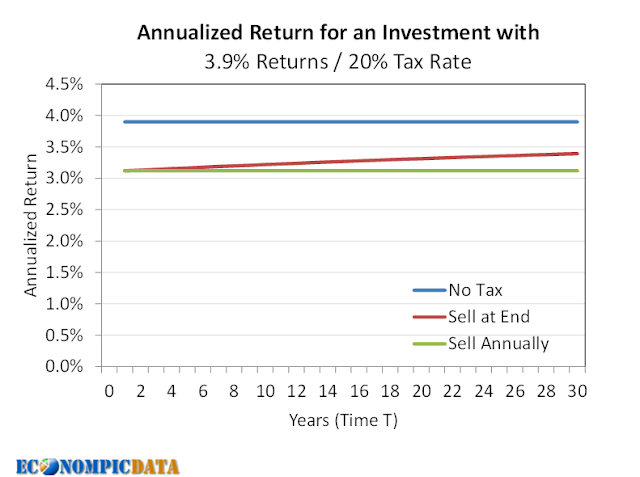 A buy and long-term hold investor only needs a 3.9% pre-tax annualized return in stocks to get to the same 3.3% after-tax compounded return over 30 years. In other words, at the highest tax bracket, the pre-tax returns for a long-term investment in taxable bonds needs to be 30% higher than for stocks to get the same after-tax return.